These colorful nocturnal fish use their swim bladders to make sounds at each other. They are usually reddish with a golden sheen on top and side, with white underneath, and have noticeably large, dark eyes. They hide in crevices during the day, and come out to hunt meroplankton at night across sandy bottoms and in seagrass beds. English language common names are squirrelfish, common squirrelfish, cook, hardback soldier, longjaw squirrelfish, maryanne, rotten finger, squirrel fish, striped squirrelfish, and welchman. Other common names include Atlantisk egernfisk (Danish), bar ‘i klabu (Papiamento), candil (Spanish), candil de vidrio (Spanish), candil gallito (Spanish), candilero (Spanish), caqui (Creole/Portuguese), carajuelo (Spanish), carajuelo de ascención (Spanish), carajuelo gallito (Spanish), cardinal (French), cartinau (French), diablito (Spanish), eichhörnchenfisch (German), esquilo-caqui (Portuguese), gailo (Spanish), jaguaraçá (Portuguese), jaguareçá (Portuguese), jaguariçá (Portuguese), jaguaruçá (Portuguese), jaguriçá (Portuguese), joão-cachaça (Portuguese), juguriçá (Portuguese), Kandèlchi (Papiamento), marignan coq (French), mariquita (Portuguese), mariquita olhão (Portuguese), matajuelo (Spanish), nobori-ebisu (Japanese), olho-de-vidro (Portuguese), parra (Spanish), realito (Portuguese), soldado (Spanish), tararaca (Portuguese), and vuurvisje (Danish). The squirrelfish is of low commercial importance however it is frequently taken in artisanal fisheries off of Brazil and Venezuela with traps, handlines, and gillnets. It shows resilience through the ability to survive for days within traps and to survive in highly polluted waters. It is sometimes marketed fresh. This species is common displayed in public aquarium facilities due to its beautiful red coloration and distinctively large eyes. 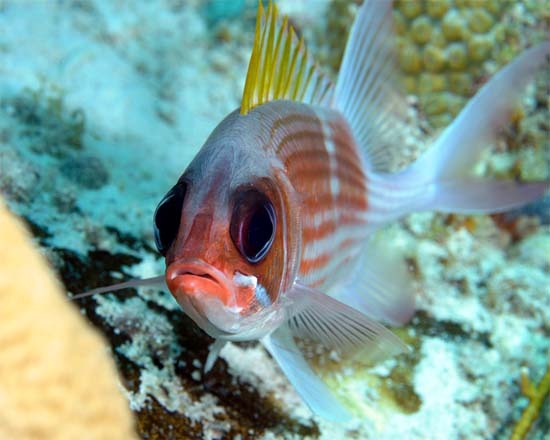 The squirrelfish has not been evaluated by the World Conservation Union (IUCN). The IUCN is a global union of states, governmental agencies, and non-governmental organizations in a partnership that assesses the conservation status of species. The squirrelfish is found in the western Atlantic Ocean from North Carolina (US) and Bermuda, south to Santos, Brazil including the Gulf of Mexico. It also lives throughout the West Indies and Caribbean. 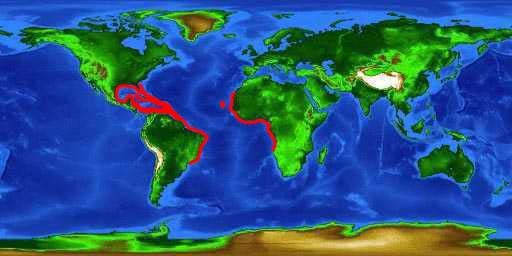 In the eastern Atlantic, this species resides in the islands and tropical and subtropical waters including St. Helena and Ascension Island and along the African coast from Sao Tome Island and Gabon, south to Angola. Occurring in deeper offshore waters as well as over shallow coral reefs, the squirrelfish can be found at depths to 590 feet (180 m) but more typically to 100 feet (30 m). It is a nocturnal species, swimming over sandy bottoms and seagrass bed at night, searching for prey items. 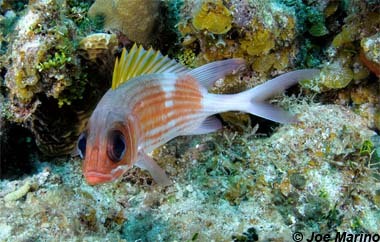 During daylight hours, squirrelfish hide in crevices and under ledges within coral reefs to avoid predation. Juveniles form aggregations while adults tend to be more isolated within established territories. This species is capable of producing sounds with its swimbladder for intra-specific communications. The slender body is moderately compressed and oval-shaped with large “squirrel-like” eyes. The upper jaw extends posteriorly at most to the center of the pupil. The rear of the dorsal fin and the upper lobe of the caudal fin are elongated. This species has a reddish body with gold reflections along with light silvery stripes following the scale intersections. The lower sides and ventral surface are white while the top of the head is dark red. The upper portion of the maxilla is white and there is a white streak extending diagonally across the check. The lower jaw is white and the iris is red near the pupil. The dorsal fin has yellowish to yellowish-green spines. Juveniles are thin and silvery and are rarely seen as they live out in pelagic waters before settling into suitable habitat. Small villiform teeth are present in the jaws and on the roof of the mouth of the squirrelfish. The maximum reported length of the squirrelfish is 24.0 inches (61.0 cm) total length (TL) although it is more commonly reaches a length of 9.8 inches (25.0 cm). Sexual maturity has been estimated at 5.7 inches (14.6 cm) fork length. Squirrelfish spawns year round in the warmer regions of its distribution and only in the warmer summer months in the cooler waters of higher latitudes. Documented predators of the squirrelfish include the dolphinfish (Coryphaena hippurus), mutton snapper (Lutjanis analis), yellowfin tuna (Thunnus albacares), and longlure frogfish (Antennarius multiocellatus), along with the sea birds brown noddy (Anous stolidus) and the sooty tern (Sterna fuscata). 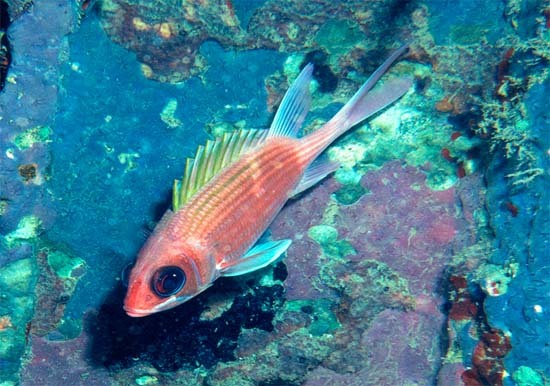 The squirrelfish was originally described as Perca adscensionis by Osbeck in 1765, however this name was later changed to the currently valid Holocentrus adscensionis (Osbeck 1765). Synonyms appearing in past scientific literature include Holocentrus ascensionis Osbeck 1765, Holocentrus sogo Bloch 1790, Holocentrum longipinne Cuvier 1829, Holocentrus longipinne Cuvier 1829, and Holocentrum sanctipauli Günther 1880. The family Holocentridae includes 65 species in 8 genera.